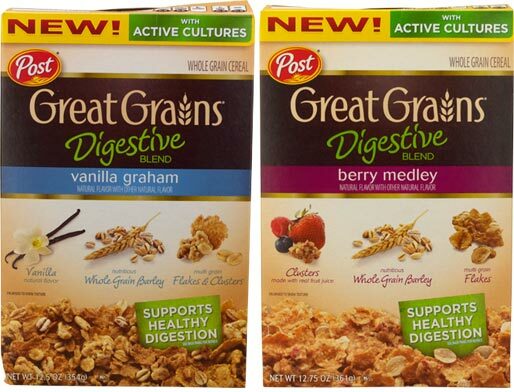 I tried two varieties of Great Grains Digestive Blend: Vanilla Graham and Berry Medley. The short of it is that these cereals are fine. There's little to complain about. But there's also very little to get excited about. Both cereals have a lot going on in terms of texture with combinations of flakes, granola clusters and puffed (yet firm) barley. There's a bit of a crunch factor if you're looking for that and the cereals takes a long time to get mushy in milk. The vanilla and graham flavors in the Vanilla Graham cereal are very subtle. It's sort of like when you have dinner at a restaurant for seniors and notice that they don't season the food as much. Everything tastes okay, but it's more of a conduit for nutrition than a dining experience. On the other hand, the berry flavor in the Berry Medley variety is exceedingly noticeable. A berry smell wafts up as you open the box and a general berry flavor permeates each bite. I found that flavor just a bit too perfumey. It didn't bother me too much as I was eating, but I found myself wanting to wash away the flavor with water when I was finished. Both cereals are quite filling and kept me feeling full for about 4 hours after eating. The selling point of these cereals is that they're supposed to support healthy digestion with their decent amount of fiber and active cultures (good bacteria). If you're looking for a cereal to help your digestion, give Digestive Blends a try. Maybe they'll help and it's better than eating nothing. 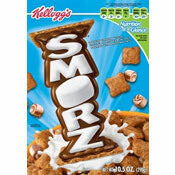 If you're looking for cereals for any other reason, check out our other cereal reviews. These cereals are kind of dull. Each 1 cup serving of Vanilla Graham Digestive Blend has 200 calories, 3 grams total fat (0 saturated and 0 trans), 0mg cholesterol, 125mg sodium, 41 grams total carbs, 7 grams dietary fiber, 8 grams sugar and 6 grams protein. Each 1 cup serving of Berry Medley Digestive Blend has 210 calories, 3 grams total fat (0 saturated and 0 trans), 0mg cholesterol, 140mg sodium, 42 grams total carbs, 7 grams dietary fiber, 9 grams sugar and 6 grams protein. 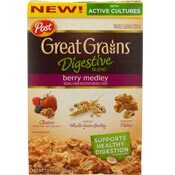 What do you think of Great Grains Digestive Blend? The Berry Medley is fraudulently advertised. Despite its name and picture of fruit, there are no pieces of fruit just concentrate. Post should be ashamed of this product. I really enjoyed the vanilla flavoring, as it reminded me that what I was eating was healthy, but not horrible. I'm not a big fan of the vanilla, but the berry medley is downright addicting. I was an avid Kashi GoLean eater for years until I tried the Great Grains Berry Medley, and now I eat about three bowls a day with unsweetened almond milk and it's delicious! GREAT cereal. Kept me full and was very tasty. I am suggesting this to my family... we are always looking for ways to better our digestive health. The Post vanilla graham cereal is the worst. It made me feel sick.